We often think of our brains as being at the centre of complex motor function and control, but how 'smart' is your spinal cord? Turns out it is smarter than we think. It is well known that the circuits in this part of our nervous system, which travel down the length of our spine, control seemingly simple things like the pain reflex in humans, and some motor control functions in animals. Now, new research from Western University has shown that the spinal cord is also able to process and control more complex functions, like the positioning of your hand in external space. "This research has shown that a least one important function is being done at the level of the spinal cord and it opens up a whole new area of investigation to say, 'what else is done at the spinal level and what else have we potentially missed in this domain?'" said the study's senior and supervising researcher Andrew Pruszynski, Ph.D., assistant professor at Western's Schulich School of Medicine & Dentistry and Canada Research Chair in Sensorimotor Neuroscience. The study, "Spinal stretch reflexes support efficient hand control," will be published online in the high impact journal Nature Neuroscience. This kind of hand control requires sensory inputs from multiple joints—mainly the elbow and the wrist—and these inputs was previously thought to be processed and converted into motor commands by the brain's cerebral cortex. Using specialized robotic technology, a three degree of freedom exoskeleton at Western's Brain and Mind Institute, subjects were asked to maintain their hand in a target position and then the robot bumped it away from the target by simultaneously flexing or extending the wrist and elbow. The researchers measured the time that it took for the muscles in the elbow and wrist to respond to the bump from the robot and whether these responses helped bring the hand back to the initial target. By measuring the latency, or 'lag', in the response, they were able to determine whether the processing was happening in the brain or the spinal cord. "We found that these responses happen so quickly that the only place that they could be generated from is the spinal circuits themselves," said the study's lead researcher Jeff Weiler, Ph.D., a post-doctoral fellow at Schulich Medicine & Dentistry. "What we see is that these spinal circuits don't really care about what's happening at the individual joints, they care about where the hand is in the external world and generate a response that tries to put the hand back to where it came from." This response generated by the spinal cord is called a 'stretch reflex,' and has previously been thought to be very limited in terms of how it helps movement. 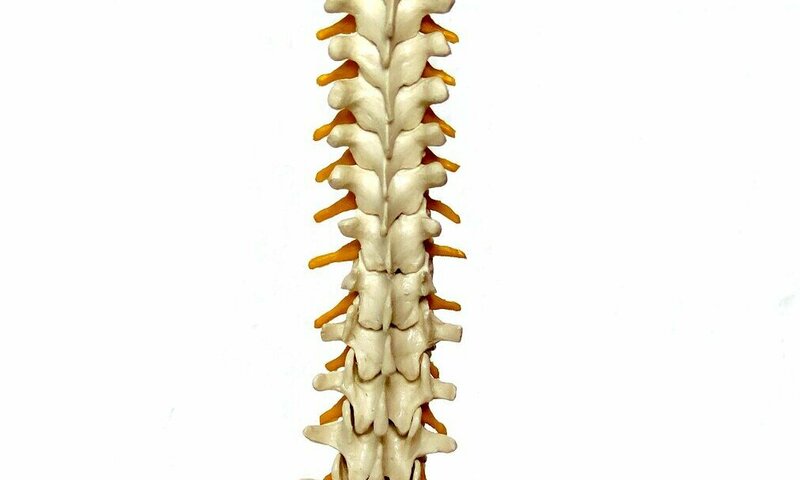 "Historically it was believed that these spinal reflexes just act to restore the length of the muscle to whatever happened before the stretch occurred," said Pruszynski. "We are showing they can actually do something much more complicated—control the hand in space." This finding adds immensely to our understanding of neuroscience and neurocircuitry, and provides new information and targets for rehabilitation science. "A fundamental understanding of the neurocircuits is critical for making any kind of progress on rehabilitation front," said Pruszynski who is also a scientist at Western's Robarts Research Institute and the Brain and Mind Institute. "Here we can see how this knowledge could lead to different kinds of training regimens that focus on the spinal circuitry."